It takes minimum of 7 days to do one room. Additionally no painter does only 1 wall. Just 2 hours for one wall and 8 hours to do the entire room. Plus you can change even 1 wall at a time if you desire. Texture paint is inconsistent in design due to the manual nature of design creation. Consistency in design and texture since the design and texture is machine made. Starts developing cracks in 2-3 years. Lasts for at least for 8 years. Paint starts fading in 2-3 years and needs another coat of paint to freshen up. If spoiled, needs complete re-painting of the wall. Can be serviced easily with invisible patch work as well. Emits Lead, harmful for environment, plus the smell and dust creates a huge mess. Asthma patients and old people have to avoid the same. Environment friendly with no smell or dust created. Attracts fungi, bacteria and dust especially when leakage strikes. Anti-fungal, anti-bacterial and repels dust. Dust leaves marks forever and not washable. Made with vinyl and thus 100% washable with any soap detergent. Paint is a good conductor of heat and cold. Thus in summer a wallcoverings applied room will be cooler as compared to a painted room and in winter it will be warmer as compared to a painted room. Wallcoverings work as thermal insulators there by reducing the heat in summer and cold in winter in your room. Test reports certify a 5.5% saving in consumption of electricity. Plastic paint costs between 30-35 per sft installed and other finishes like velvet etc go higher. However if you go for darker colours then the price further increases due to extra coats of paint to achieve the colour. On the other hand texture painting the range is between 60-150 per sft. Our wallcoverings range starts from 27 per sft and goes as high as 2000 per sft. However all the wallcoverings are textured. Thus textured wallcoverings are cheaper by 50% as compared to texture paint and similarly priced as compared to plastic paint. Variety is extremely limited and the variety lies only in choosing the colour. Unbelievable variety of more than 5000+ designs and textures in varied colours. With the range of digital wallpapers, one has to just imagine and the same can even be replicated on the wall. Paint gives a very flat, barren and Full of Lifelifeless look to the wall. Wallcoverings give a beautiful structure to the wall making them and the interiors look beautiful and rich. All high end places be it 4 or 5 star hotels, corporate offices, luxurious homes, mockup apartments by builders prefer wallcoverings to enhance their interiors. 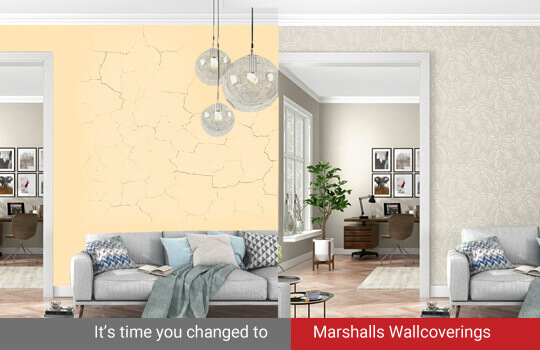 Marshalls vinyl wallcoverings are fire retardant, high tear and scratch resistant.